SALZBURG, AUSTRIA—Britain and its European Union partners failed on Thursday to secure a breakthrough in Brexit talks, largely because of seemingly intractable divisions over the best way to avoid a hard border on the island of Ireland and how to deal with future trade. With Britain’s departure from the EU looming — March 29, 2019 — there are growing concerns that a deal on the post-Brexit relationship may not be cobbled together in time to ensure a smooth and orderly British exit. All leaders, including British Prime Minister Theresa May, are desperate to solve the biggest Brexit riddle — how to keep goods moving freely between Northern Ireland in the U.K. and EU member state Ireland. Despite reports of a friendly spirit at a summit in Salzburg, Austria, the fundamental differences remained and EU Council president Donald Tusk said parts of May’s Brexit plan — dubbed Chequers after a key Brexit meeting at the premier’s country residence of the same name — simply will not work. But just minutes after he spoke, May insisted that her Brexit plan is the “only serious and credible” proposal on the table. 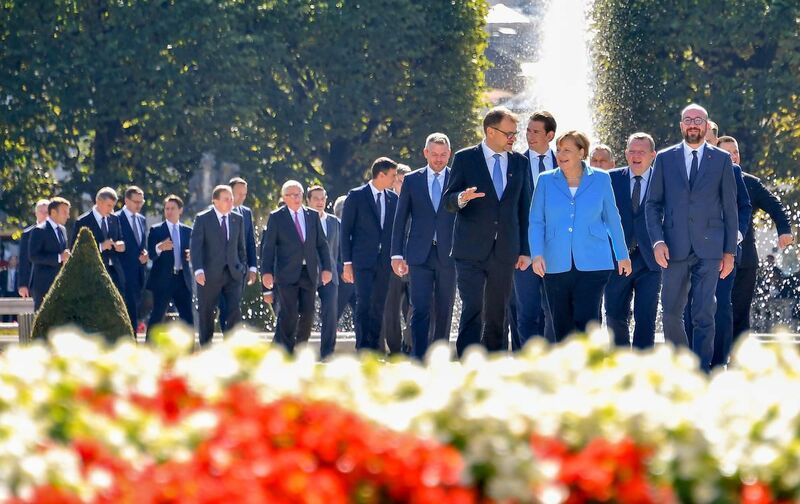 Like many leaders, including May, Tusk said “we need to compromise on both sides.” He wants to see a major breakthrough by the time the leaders meet again in Brussels on Oct. 18-19. A special Brexit summit could still be set up in mid-November if things progress as hoped. If Britain is to leave with a deal in six months, May and the Europeans must find solutions in coming weeks so parliaments have enough time to ratify the agreement. They’ve spent two days in Salzburg trying to do just that, but with things at a standstill, the sides have tried to ramp up pressure on each other. Each is urging the other to compromise while the EU issues constant warnings to Britain about the Brexit clock ticking. Tusk said that key parts of the British proposals to leave would undermine the union of the 27 remaining members. May has been looking to keep some part of trade between the U.K. and the EU in the bloc’s single market but not others. The EU has insisted that the single market cannot be cherry-picked like that. Tusk said of her Chequers proposals that “the suggested framework for co-operation will not work, not least because it risks undermining the single market” of seamless movement of goods, services, capital and persons. Any Brexit deal will include a withdrawal agreement and transition period to smooth Britain’s exit from the bloc. Currently that’s expected to last until the end of 2020 but if there is no deal to avoid the hard border in Ireland and no political declaration outlining future relations then there will be no so-called transition period. That would lead to Britain crashing out of the EU on Brexit day, a development that in theory could see flights parked and trade between the two sides grind to a halt. For Ireland, it’s important not to undermine the hard-won peace after decades of sectarian tensions in neighbouring Northern Ireland. “What we want to avoid is any new barriers to the movement of goods, any new barriers to trade, any new barriers to the movement of people,” Varadkar said. It all suggests a fractious summit in Brussels next month. “We are today at the moment of truth,” Macron warned.